While many Corsican Sheep were breed into Texas Dalls or Black Hawaiians, there are still many varieties that are worthy of mounting and they are probably the most hunted of all exotics in the United States. The Corsican Ram is a hybrid sheep is usually brown in color with horns that can vary from a curl to a spiral. 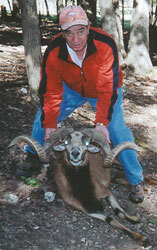 For more information on Corsican Ram Hunting at High Adventure Ranch, please call (314) 209-9800 or fill out our contact form.